I’m just going to be upfront with you guys- the co-producer of this show Melanie Hrymak (who also plays Tybalt) is a friend of mine; she also occasionally writes for this site so it’s not as if it would have taken your best detective skills to discover this badly kept secret. A few weeks ago, I told her my plan for covering this play she’d been working on for over a year. I try not to review my friends (or to befriend actors at all, but some things are unavoidable) because I refuse to lie about a bad performance and I’d rather not cause an unnecessary fight by criticizing them in public (though sometimes I do; just ask my buddy Marty). So I said that I wasn’t going to write a review; I’d just see the show and maybe do a little write-up about its existence so I could support my staff writer without passing judgment on my friend. But then I finally got to see Romeo & (her) Juliet and I decided about 15 minutes in that I wanted to write a real review. So, what I need you readers to know before we begin is that I am softening absolutely no blows because this is my friend’s show (or for any other reason); I’m not avoiding criticism to further the career of one of my writers and I didn’t like this production any extra because of my unrelated fondness for one of its creators. I’m really picky about Romeo & Juliet so I was fully prepared to hate it, but I loved this production (completely on its own merits) and I thus feel that I should tell you why. So here’s my review; I’m not going to pretend that it’s all that objective but what I can guarantee is that it’s completely honest. Headstrong Collective & Urban Bard’s adaptation is being billed as an LGBTQ production of Shakespeare’s classic text. And it is that, starring the beautiful and emotive Leslie McBay in the role of Romeo opposite Krystina Bojanowski’s gawkily endearing Juliet. Some other roles (namely the Nurse, Friar Laurence, Tybalt and Benvolio) are gender bent as well, and Paris is tellingly hetero (joining Mike Shara’s Demetrius in the 2014 club of “men Shakespearean fathers would rather have their gay daughters marry”) but I was glad to see that gender and sexuality don’t dominate this production any more than they do any other Romeo & Juliet; it’s still just a story of two bright-eyed kids, a play about people more than politics. What those casting choices do is open the door to interesting and heretofore underexplored character angles while defining the production’s modernity (at some point the complete imbalance of male to female characters as originally written starts to feel unrealistic when played in a modern setting; this fixes that). I’ve written a lot this year about the importance of finding new truth in old texts (especially Shakespeare) and director Scott Emerson Moyle uses the LGBTQ and gender-blind angle as a jumping off point to do just that. What I liked most about the production is that he didn’t stop there. It’s been a few years since I’ve seen really great work from Moyle’s Urban Bard but, back in 2010 when they first appeared on my radar, their productions stood out for their pacing, energy and excellent use of found space. Here said space is the Bloor Street United Church where the action of the play is framed by a memorial service for the title characters (tributes to the also-departed Tybalt adorn a table outside the door, including a guest book and condolence cards featuring the amusingly loopy handwriting of the name-checked Rosaline among other Verona residents). Usually an Urban Bard show requires walking around but all of R&(h)J can be seen from a seat in the church pews, as long as you’re willing to rotate. The almost theatre-in-the-round setup of the nave facilitates easy scene transitions and allows backstage work (moving a table, a dead character leaving the stage) to happen as another character distracts the audience into turning their backs. At one point in act five, a quick look up to the balcony reveals Friar Laurence dialling a phone in Verona, causing Romeo’s cell to ring in Mantua down below (a clever device used in place of Friar John). Only the scenes in Juliet’s bedroom present real sightline issues as Moyle remains unhelpfully loyal to his chosen II.ii balcony location, much to the detriment of the all-too-important III.v which is very hard to see from below. A clever script cut rearranges a few scenes and steals dialogue from late in the play to inform earlier encounters (Mercutio incites Tybalt to violence in I.i with the II. iv line “a very good whore”) and thoughtful staging eliminates the need for a lot of servants and messengers by simply having characters overhear each other (most notable is the elimination of Peter; Romeo and Benvolio are just standing nearby when Capulet tells Paris about the party). The strangest cut is to the final scene where the absence of Lord Montague leaves the story without its usual reconciliation. Instead of declaring the end of the Montague-Capulet feud, the surviving characters (Friar Laurence, Benvolio, the Capulets, the Nurse and Paris who is miraculously spared this time around) file quietly out of the church, leaving the audience in strained silence awaiting a curtain call that never comes. Lord Montague is a frustrating character to cast since he only has about 15 lines, so I understand the instinct to remove him from a production that otherwise avoids double casting almost entirely (Paris moonlighting as the Apothecary and the Nurse’s appearance as “Sgt. Prince” are the only noticeable doublings) but the lack of resolution his absence facilitates makes it hard not to wonder what was the point of it all. Though perhaps that is the point- the pointlessness of hate and deterring love in any form (coming back to the LGBTQ theme that is smartly not over-explained). The feud actually seems to take something of a backseat throughout this production. With a cast this small (ten, to be exact), there are simply very few people actually involved in the conflict. Mercutio here takes a more Montague-ish role than originally written, but he has to since- without Romeo- that entire side of the fight is represented by just Benvolio (the theoretically peaceful Benvolio, that is). The Capulets are better represented since Juliet has two parents to Romeo’s none and three of the text’s most insightfully interpreted characters fall on that side of the feud (or at least adjacent to it). Urban Bard has a strong history of casting women in combat-heavy roles so it wasn’t all that surprising to find the fight-trained Hrymak playing the traditionally alpha-male hothead. What I wasn’t expecting was the total embracement of her femininity. If you want to talk about a gender and sexuality-progressive interpretation, let’s talk about the text’s most aggressive male character played in female iteration not as a tomboy or vixen but as a stubborn young woman capable of as much vulnerability as ferocity (without tempering the ferocity). While we’re at it, let’s also talk about Shawn Ahmed’s immensely sympathetic performance as the Nurse (with that tiresome I.iii speech thankfully cut), resisting the all-too-common urge to interpret “male nurse” as “flamboyant stereotype of a male nurse”, crafting a wholly unique and subtle interpretation within the gender swap. Tybalt’s hostility towards Max Tepper’s carelessly jovial Mercutio is rooted in a clearly played but not annoyingly overstated backstory (which comes to a head in a brilliant moment wherein she learns that her wound has killed him) and her connection to the other Capulet characters is reinforced by her presence in unexpected places like I.iii where she reads magazines and jokes with the Nurse (“the best friend I ever had”) as Juliet receives the news of her impending nuptials. “Carelessly jovial” is a compliment, by the way (a true-to-form fault of the overly charismatic), and the best thing about Tepper’s delightful but somewhat overshadowed Mercutio. Tybalt also enjoys an unusual and fairly fascinating expanded relationship with Paris who, like Mercutio to the Montagues, is played as a full-on Capulet in this production (if not related by blood, allied closely enough to be directly involved in the feud). Thankfully avoiding the colour coding that distinguishes the two families in most productions, the aesthetic divide here is a grungy look for the Montagues (notably all younger characters) and a preppy one for the Capulets, defined most exactly by Adrian Shepherd’s Paris in a charming performance that, if not wholly humanizing for the often mistreated character, at least presents him as awkwardly over-eager more than vapidly sleazy. By manufacturing a relationship between two Capulet-aligned characters who don’t meet in the original text, the production suggests a fuller social existence where the over-the-top mourning of Tybalt is plenty justified and the bizarrely intense marital commitment to Paris is at least somewhat understandable in a modern context that doesn’t jibe with simple “political alliance” excuses (theoretically Paris has spent a lot of time around this family; Lord Capulet loves him like a son and trusts him with his daughter’s hand. It feels less sinister somehow). An across-the-board strong, smart ensemble fills out the world of this completely relevant adaptation with thoughtful and inventive choices. But it’s the charm and chemistry between McBay and Bojanowski that really grounds the production. McBay in particular is enchanting, gazing at the light breaking through yonder window as though it were the most beautiful thing in all the world. Her Romeo displays the restless love addiction that makes the speed of this romance most worrisome and the reckless temper that brings about its ultimate downfall. The tender compassion of Romeo’s encounter with the starving Apothecary balances with the quickness of her wit when she returns to her friends after wooing Juliet (the look of joyous relief on Tepper’s face when Mercutio sees his friend returned to form is a highlight of the production). The intimacy and respect she shares with Lisa Karen Cox’s bold Laurence is as unshakeable as her loyalty to Clare Blackwood’s wild Benvolio, even as everything else is swept up and ultimately destroyed by the sheer force of her feelings. McBay is a female Romeo and that’s marvellous for all sorts of reasons but, more than being a female Romeo, she’s an excellent Romeo and that is simply far more important. 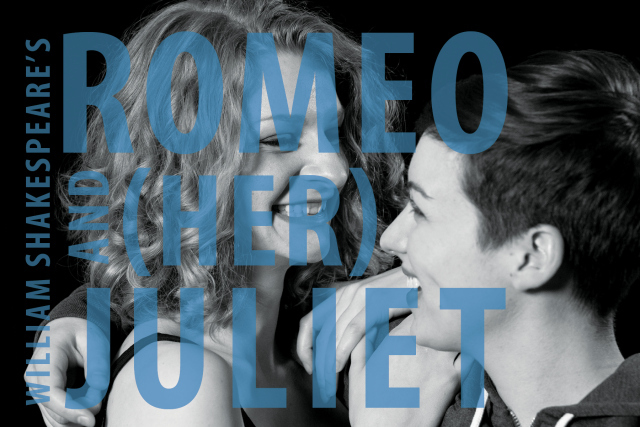 Romeo & (her) Juliet plays at the Bloor Street United Church until September 20th. You should go. Click Here for more information.